You are going see for yourself in the next few posts that I wasn’t kidding about working my way through refrigerator, freezer, and pantry. You might also find yourself slightly amused by the kind of ingredients that accumulate in my kitchen. Recent trends you might notice: dried apricots, raw seeds, winter squash, potatoes, and frozen corn (our CSA farm has no problem growing potatoes or corn, even in weird growing years like this one). At first I was shy about this repeating of ingredients and contemplated staggering my recipes so that there wouldn’t be five in a row featuring dried apricots. But then I thought those of you who might actually be making the food I rave about (and I know of at least two of you and I love you love you love you!) would appreciate some options to help you make use of those less familiar ingredients that you perhaps acquired only to try out some of the recipes posted here. What I’m trying to tell you is this: I’m not boring. I’m helpful. On to the dried apricots! I shared this bread with my dear girl Lisa the other day and she said, “is this one of the breads Michael made?” (Michael is my husband, the family breadmaker.) I was so excited to say, “No! 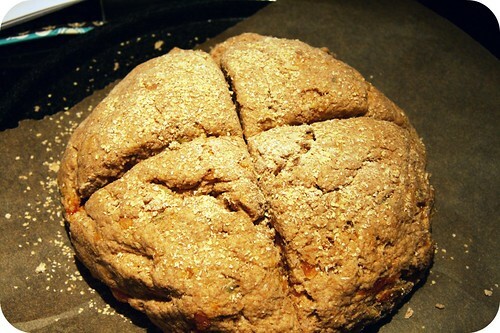 I made it!” Because soda bread, by definition, doesn’t have yeast, which scares me, so I can handle it. And I sort of love it. It’s dense and a little chewy (but in a good way – chewy delicious) and it’s rustic and hearty, excellent for soaking up soup or stew. (Which I imagine is what they do with it in Ireland?) It’s also really great with a big slab of salted butter or a thick slice of hard, well-aged parmesan cheese. 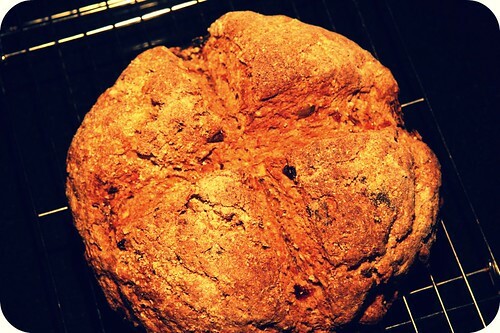 Irish soda bread: easy AND versatile! Also it freezes perfectly and thaws easily in the microwave or overnight on your counter. 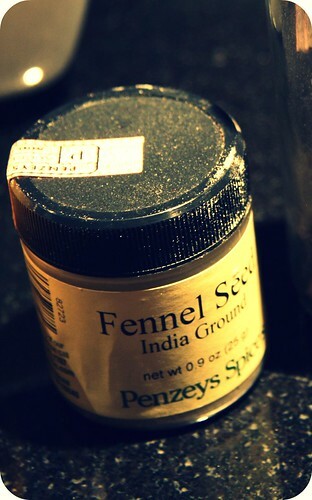 Before we get to the recipe, I just want to make a note of one ingredient that is decidedly optional: fennel seed. Preheat oven to 350 degrees. Line a baking sheet with parchment paper or a Silpat. Mix milk and vinegar in a measuring cup and let stand for about 5 minutes. In a large bowl, whisk together, flour, salt, baking powder, baking soda, and fennel seed. Using a pastry cutter or your fingers, cut in butter until the mixture is sort of sandy, with some larger bits. 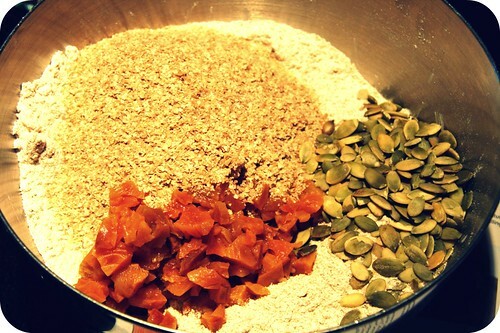 Add bran, wheat germ, pumpkin seeds, and apricots and stir until everything is evenly incorporated. Pour soured milk into the flour. Stir with a wooden spoon until dough is sticky. Turn the dough onto a lightly floured surface. Using floured hands, gently form the dough into a round, dome-shaped loaf, about 7 inches in diameter (mine was more like 10 inches). Transfer to baking sheet. Dust with wheat germ or bran or more flour. Score an X into the top with a sharp knife. Bake until loaf is golden brown, about an hour, rotating half-way through to allow for more even browning. Let cool on a wire rack. * You could substitute 1 2/3 cup of buttermilk or plain yogurt thinned with a tablespoon of water. ** These items are found in the refrigerated bulk section of our grocery store. They might be hard to find at big stores, but I’m sure Whole Foods or something comparable would have them. You could use all bran (as the original recipe calls for) rather than part bran and part wheat germ. Finally, this is, I suspect, an extremely forgiving recipe. Regular flour, any kind of whole wheat flour, or spelt flour would probably work fine. Raisins or currants are the norm in Irish soda breads and could replace the apricots. Any seed or nut could substitute for the pepitas, or they could be omitted entirely. Enjoy!